A heat recovery system will provide a continuous supply of fresh, warm air to the inside of your Calgary home. It’s extremely important that these systems meet installation requirements for proper performance. There are two types of heat recovery systems and three ways to install the ductwork for the incoming fresh air and the exhaust air. Designed to bring a continuous supply of fresh air into your home (while removing an equal amount of air from inside your home with exhaust) a Heat Recovery Ventilator, or HRV, is a system that combines a supply motor with an exhaust motor in one unit. An HRV is also has a “sensible” heat recovery core. An aluminum core allows heat to be transferred from the warm air stream exhaust to the incoming stream of fresh air. Fresh air coming into the home is tempered by heat from the exhaust air, providing energy savings. An ERV includes a feature allowing some of the moisture to be transferred between incoming and outgoing air streams. During the winter, the cold, dry air is drawn in and warmer humid air is forced out, keeping Calgary homes more comfortable and increasing energy efficiency. In the summertime, an ERV does the opposite. It removes heat and moisture from the incoming air, transferring it to the air going out. Both HRVs and ERVs draw fresh air in and force stale air out. Both systems rely on a large powerful fan. If your home is tightly sealed, an ERV is the best option. If you enjoy leaving your windows slightly ajar, an HRV is the better option. 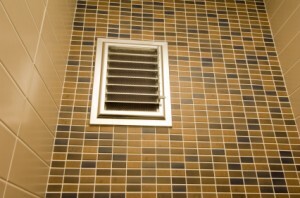 The preferred way to install this type of system is simple – provide the ventilator with its own ducts. You don’t need to use as many ducts as you do with a central heating system. While it may seem counter intuitive not to use your central ducts because they already exist, you really don’t need to use them. These systems work best in Calgary homes for pulling stale air from critical areas like bathrooms, laundry rooms, and kitchens and supplying fresh air to a point where it will naturally flow through the house. Simply supply the fresh air to a central area or bedroom and it will be drawn in and distributed throughout your home. Not as effective as a fully ducted system, this system uses the HRV in conjunction with a forced air system. In this system, the HRV supplies fresh air to the air return of the furnace system where it is mixed with the inside air and distributed through the home. Again, stale air is pulled through separate ductwork from critical areas like bathrooms, laundry rooms, and kitchens and exhausted to the outside. The HRV is interlocked with the furnace so they operate at the same time, ensuring air is properly circulated. This is the most ineffective of the three systems. In a simplified system, the HRV uses the furnace return ductwork for both supply air distribution and exhaust air collection. This system doesn’t target critical areas and much less fresh air is returned. Improper installation of this type of system results in a short-circuiting of fresh air, because the fresh air is just exhausted again. HRV and ERV systems work very well in Calgary homes, but must be installed properly. Not all systems are created equal. Make sure you understand which system you are getting. Ask to see the manufacture’s guide for the system; it will show you the installation requirements for proper performance. If your home feels uncomfortable or you find you’re using large amounts of energy, chances are the system isn’t properly installed.